These have mandibles with teeth on inner faces. Abdominal cerci – 2 segments. Pronotum is flat with no anterior lobes. Is approximately 5.0 –7.5 mm in length. Has a narrower head with slender mandibles. Is approximately 3.0-5.0 mm in length. Upon hatching, the nymphs are then fed by the workers until they eventually develop into adults. This developmental phase is affected by temperature, the availability of food and general health of the colony. As a result, the workers will feed the nymphs for approximately 2 – 3 months before they hit maturity. During this phase the nymph will go on to moult 4-7 times before finally maturing into a soldier, a worker or winged reproductive. Soldiers and workers can live for 1-2 years. Kings and queens can live for over 20 years. After reaching maturity, young winged reproductives (alates) leave the colony in order to mate and establish new termite colonies. Once a suitable site has been found for colonising, they shed their wings and turn into kings and queens. 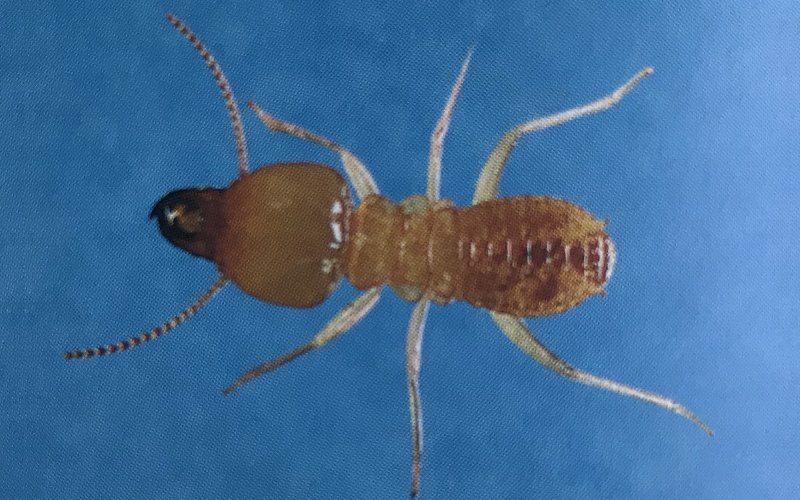 These kings and queens are responsible for the creation of a whole new termite colony. After mating the queen will lay several eggs. While a new colony is being developed, this pair must feed and care for the young. This will continue until there are enough workers in the colony to assist the queen in looking after the brood. The king will spend its entire life alongside the queen in the central nursery. The worker caste is the most common in any termite colony. They are responsible for all the tasks in the colony except for reproduction and defence. They build the nest, collect food and care for the young. They also feed the soldiers and the young reproductives. The reproductive caste has large compound eyes. They are darker than the soldiers and workers. They have an outer covering that is also thicker than that of the workers and soldiers. They are also often bigger in size. Once fully grown, the winged reproductives (alates) will fly away on a colonising flight. This happens in the summer months. And only when the humidity and temperature outside matches the conditions inside the colony itself. They are highly destructive and like to build their nests beneath man-made structures, in tree stumps and in root crowns. They prefer areas where the wood or timber is in direct contact with the soil. This is because it speeds up the decomposition process of wood and timber. This species is commonly found in New South Wales, Queensland, the Northern Territory and Western Australia. The worker termites will eat cellulose. This is a naturally occurring substance found in wood and various wood products. Termites digest it with the assistance of their own by intestinal enzymes. They also eat fungi and other types of organic material. This is a major pest species found along the eastern coast of Australia. If you come across swarming termites, it is a good indication that there is a large termite colony nearby. Subterranean termites cause more damage to homes in Australia than storms, tempests, floods and fires combined. Schedorhinotermes Intermedius are a very damaging skittish species and care must be taken so as not to disturb them during treatment. Otherwise they will simply relocate elsewhere within the property.